The fruit of the olive tree, native to the eastern Mediterranean. The ripe (purple) or unripe (green) fruit is stored in brine to remove its naturally bitter flavor before consumption, and the ripe olives are ground to extract their oil, highly valued in cooking. Olives have been used as food for thousands of years; the city of Athens, Greece is named for the goddess Athena's gift of an olive tree to its citizens. Olives are high in fiber, Monounsaturated fat, iron, and vitamin E.
Olives come in a variety of shapes, sizes and colors. They can be black, green, slightly purple or brown. They are generally round or egg shaped. Sizes range from slightly larger than an almond to about the size of a 50 cent piece. They come either, with the pits intact or pitted and sometimes stuffed with everything from peppers and anchovies to cheese and nuts. Most often they will be stored in a brine, but can be cured in oil or salt. Choosing: Select olives based on your own personal tastes or the recommendation of your specific recipe. When selecting bulk olives, avoid any that are soft and mushy. Buying: Many markets and ethnic specialty stores have deli departments with a variety of brined olives available in small and large amounts. Olives are also readily available canned and jarred. If you have an olive tree, you can try brining your own. Procuring: Green olives are picked while unripe, which makes them denser and more bitter than brown or black olives, which stay on the tree until fully ripened. Olives become bitter if they're cooked too long, so always add them to hot dishes at the last minute. A staple of Mediterranean cuisines, olives are most often eaten out of hand, though cooks also use them to flavor everything from pizzas to martinis. Olives are eaten as a finger food as well as in recipes. Olives are pressed to extract healthy olive oil. Cleaning: Most olives have been cleaned prior to canning or bottling, however, you may want to drain them from the liquid. Opened cans or jars of olives should be refrigerated, but some olives can be stored at room temperature if they're submerged in brine or olive oil. Olives are quite often served in social gatherings as a snack or complement to a cocktail. They are often considered a bar snack. 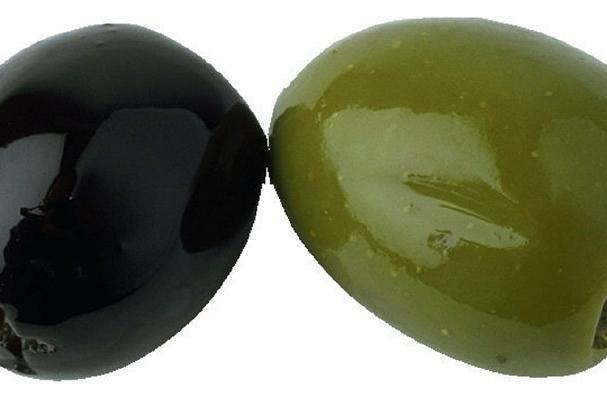 History: Olives have been produced in Lebanon, Jordan and Israel/Palestine from prehistoric times.